One of the most ironic turns of fate in an actor's life during the past century took place within the domains of the twisted cross in 1944. Kurt Gerron (1887-1944), a noted actor, cabaret performer, and director, who established himself in pre-war Germany, was a man obsessed with his work. The zeal with which he approached any project he worked on was as well known to his friends as his dedication to the craft. A large figure of a man who was known for a friendly attitude (he was nicknamed "Pappy") and an open mind would find his nemesis in the concentration camps of Westerbork, Theresienstadt and Auschwitz. The final days leading to his demise are tinged with a macabre and naive hopefulness. The fact that his name has practically been swept away with the dust of memories testifies how civilization and the whimsicality of fashions (both in arts and politics) can affect humanity and the arts. A name once popular has practically become forgotten and rendered almost meaningless to the wide public, but the story behind the man has not diminished in its strength. Among the general population, he might still be recalled as Marlene Dietrich's impresario and the performing magician in Joseph von `Sternberg's 1930 film "Der Blaue Engel" ("The Blue Angel"). His work included seventy film rolls as actor and eighteen films as director (five for the Berlin UFA studios) as well as a long list of theatrical associations (he was, for example, the man who played the original role of Tiger Brown onstage in Brecht and Weill's 1928 "Der Dreigroschen Oper" ("Threepenny Opera"). After the National Socialists gained control of Germany, Gerron emigrated for a period to France, a shorter time to Austria, and finally wound up in the Netherlands (where he directed three films). In Amsterdam, Gerron became director of the "Hollandse Schouwburg" (Dutch Municipal Theatre) on the Plantage Middenlaan. This location (or what remains of it) is nowadays a memorial to the holocaust because it also served as the location where the Jews of Amsterdam were gathered together by the Germans while awaiting transport to Camp Westerbork. 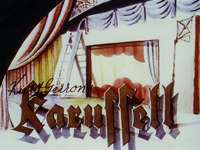 In 1943, Gerron was sent from Westerbork to Theresienstadt, where he organized cabaret performances under the title of "Karussell" (Carousel) with other artists living in the "Privilegierten-KZ". In return for his life, he also agreed to direct the German propaganda film "Der Führer schenkt Den Juden eine Stadt" about daily life in this "exemplary" camp. The enacted "daily routine" of the camp inhabitants was recorded on film by Gerron according to the strict directives of Herr Himmler. Once the film wrapped, Gerron was sent to Auschwitz and gassed. The film was never released at the time, but edited into pieces that served their deceptive purpose in the "Deutsche Wochenschau." Only segments of the film remain today. Fascinating, entertaining, and chilling, this film attempts to put an end to the renowned actor's estrangement, resuscitate him within the public's mind and reinstate his private ordeal for the public's imagination. It is the story of a performer performing for others who are performing as well. The sinister masks that many are forced to wear make the layers of reality and acting intermingle. The roles played by the characters in a scenario that is never seen become indecipherable in a horrific way. The soldiers deceive the (imprisoned) actors, the actors perform their daily tasks performing onstage (for their fellow prisoners), in a place where denial is gripped fiercely as the only source of hope. Director Ilona Ziok has assemblaged interviews with ex-concentration camp prisoners, personal acquaintances of Gerron himself, with fragments of Gerron's films as well as sound recordings of Gerron from the thirties to create this 65-minute film. The montage is interspersed with performances of songs from the Gerron "Karussell" cabaret that are interpreted by such well-known contemporary artists as Ute Lemper, Kurt Raab, and Bente Kahan. Listed among the songs are "Ode an Berlin", "Ich wander durch Theresienstadt", and "Wenn man kein gluck hat". Max Raab's rendition of "Das Nachtgespenst" is mesmerizing. Gerron's rendition of the same song (during the end titles) is chilling. The interviews and comments (including one with Camilla Spira, who worked with Gerron in the transit camp at Westerbork) might leave one longing for a lengthier exposé, whereas the final (impressive) result achieved here is that of an impressionistic documentary. By mixing facts and archive film footage alongside performances of songs from old Berlin, an attempt is made to capture a feeling of a specific time, to morbidly entertain while commenting on events, to show the darker side of the performance curtain, and to show what alterations the human mind can make when concentrated on survival. For those wanting a more intellectual and detailed analysis, the search for relevant reference books can only be suggested to serve as an extension for the opening of this incredible page in history. There is little known about the man inside the man and the elusive aspect of his private life is captured within the confines of this film. This film has a strange and stunning effect on the viewer which brings back memories of the 1974 Dutch production "Zaliger Nagedachtenis" ("In Loving Memory") starring Gerard Thoolen which dealt with the situation in Holland during the German occupation by attacking it head on through a fierce and chilling satire. It included a cabaret-like performance of victims with their perpetrator. Unfortunately, this film was haunted by several difficulties during its making, including the crew's expulsion from the Amsterdam shooting location at the last minute (the same "Hollandse Schouwburg" mentioned above) by order of the city's mayor. The final result, approximately a half-hour film, was finished elsewhere and only shown at three closed screenings before it was resigned forever to concealment. Although this short film was made almost thirty years after the war, many were so shocked and outraged during the screenings that some uttered remarks aloud. Unfortunately, the wider canvas buried within that apparently frivolous, but very biting satire was, for the most part, intentionally disregarded. The film was rapidly placed under covers by administrative production heads, so that its existence became conveniently ignored. Why condemn something when you can erase all trace of it? Retained within closed quarters, this film also faced the destiny of never being released and for the last twenty-five years has not seen the light of day. "Gerron's Karussell," on the other hand, is an incredible film that is available for viewing. It also begs for a retrospective and reassessment of the man Kurt Gerron and his work. In this connection the Dutch Filmmuseum has arranged a retrospective of his work. Anyone interested in films dealing with the holocaust must see this one.